Chilmark - The up-island town of Chilmark is known for its rolling hills and magnificent views. Ancient stone walls gracing the countryside are a common sight in this New England town. Chilmark's coastline is very dramatic, ranging from the sloping sandy beaches of the south shore to the rocky coast of the north shore. The town of Chilmark was named for Chilmark, England, the ancestral home of Thomas Mayhew's wife. For centuries Chilmark consisted mainly of farmland and the tiny fishing village of Menemsha. 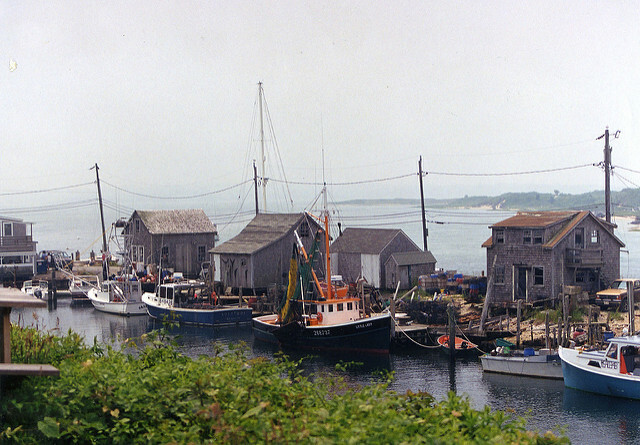 Menemsha is now world-renowned for its subtle beauty and traditional New England charm. In addition to being a classic New England fishing village, it is one of the only harbors on the east coast where you can watch the sun set into the sea. Among the best features of Menemsha are the dockside fish markets where you can have your lobsters cooked to go or pick up some of the freshest seafood imaginable. Some popular take-out dining options in Menemsha include Larsen’s, The Bite, and The Galley. Many locals & visitors enjoy the tasty food while sitting on the beach and watching the beautiful sunset over the Menemsha Bight. Chilmark has some great sit down restaurants, too. The Chilmark Tavern specializes in seasonal bistro style food. Home Port is a waterfront restaurant featuring traditional seafood cuisine and fantastic views. The restaurant at Beach Plum Inn features fresh seafood, prime meats, and amazing views. Chilmark has many beautiful beaches. Squibnocket Beach is for town residents only and has beautiful views of the Atlantic Ocean and one of the best surf spots on the island. Lucy Vincent is a private scenic beach for town residents only during the summer. It’s open to the public during the off-season. This beach has a beautiful pristine coastline with great surf and wonderful views. Menemsha Beach is a public beach with a gentle surf and one of the premier spots on the island to watch a sunset. The largest network of Land Bank trails wind around the town of Chilmark. Chilmark has its own community center with year-round activities and events to enjoy. Most of the clothing, jewelry, and antique shops are in Menemsha Village. Chilmark boasts some of the highest property evaluations in the state, yet has one of the lowest tax rates. Search current real estate listings in Chilmark and Menemsha.